The airplane full of passengers, after hurtling through the atmosphere in flames, comes to a screeching halt just a few feet over a baseball diamond. Thank goodness, Lois is safe and Superman has saved the day again. The whole crowd is on its feet at this spectacle. When they realize what has taken place, that Superman is back, they burst into applause. Hubby and I burst into tears. We, like the audience at that baseball game, were so happy to see Superman again: “Thank goodness, I’m so glad he’s back. I’m so happy to be HERE, at a movie, with YOU.” This is only the second movie Hubby and I have seen since Sam was born, not including the 2 that we tried to take Sam to when he was younger because, well, they just don’t count. And we used to be a couple that would go to a movie and on the way out decide we wanted to see another. So it was a big deal to be at the theater, a few hours that made the trip to visit the in-laws well worth the travel in the car with the infant, even though the fireworks were cancelled. And it’s not just that we got to see a movie, but we got to see Superman Returns. To be fair, it’s really not that great. But that’s not the point. That first action sequence makes it worth it, because I think for anyone of my generation we’re going to feel nothing but complete joy when we hear that music (yes, they keep the awesome music by John Williams) and feel that relief when we see that he’s done it yet again. We grew up with Superman, the amazing Christopher Reeve. We grew up with Star Wars, the original trilogy before all of the crap was added. We grew up with He-Man, Thundercats, Indiana Jones, and E.T., everyone’s favorite extra-terrestrial. What will Sam grow up with? Who will his heroes be? When he is about to turn 30, who will return to make him think, “Thank goodness, I’m so glad he’s back in my life again – I really missed him”? It makes me sad. I want my son to have all the things I had growing up. I really feel like our generation benefited from a fabulous burst on the scenes of Hollywood just as we were getting old enough to appreciate it. Some of what we had as children has become a quintessential part of our culture today. There are moments from these films that still will give you the chills when seen again. Just watch Elliot riding his bicycle at that beautiful moment before they lift off the ground and you’ll know what I am talking about. Elmo, Dora, Sponge Bob for goodness sake! They just aren’t comparable. And I realize that to Sam they will be totally and completely comparable. And I suppose that to some extent one could argue that Harry Potter and the Lord of the Rings Trilogy are comparable. But…well…I want Sam to love what I loved I guess. I want him to see Star Wars and realize how amazing it was for its time, not be distracted by what he considers to be poor special effects. I want him to feel the joy that his father and I had as children from seeing something new and loving it innocently, without cynicism or criticism. I want Sam to be able to enjoy the world in which I grew up, and I am starting to be afraid that he can’t. What if we can’t find a house in a neighborhood where it is safe for him to go out on his bike for hours with his friends? Do kids even get to do that anymore, leave for the afternoon and be free and independent? Or is the world already too dangerous, too scary? I don’t want to raise my child to be afraid of the world, but…I just don’t know…if I can. On the drive home today Hubby and I were talking about Kim Jong-Il developing nuclear weapons and my gut reaction was, “Oh my God, what if something happens to our planet before Sam gets to live his life?” I can’t even bring myself to watch Gore’s movie, An Inconvenient Truth because I already feel so amazingly powerless when it comes to the fact that I know we are destroying our world. I don’t want to be afraid, but it is so much, SO MUCH harder now that I have him. I have no control. Who will save the world for my baby? Even Superman can’t stand up to the radioactive material from his home planet. 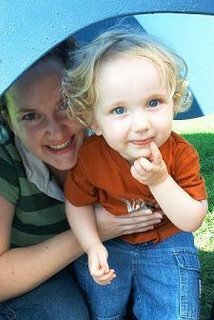 I don’t want my son to be afraid of the world, to lose his childhood to fear. I want Sam to play with his friends in the street without me watching him out the window every moment. I want him to have some clean air left to breathe, some fresh water to drink, some sunlight safely touching his face. I want for him to have some superheroes, both real and fictitious, in whom he can place his hope. And yes, I want him to have some truly awesome movies too. First: You are a fab writer! Second: You could have not put it better. I feel the same way, I fear the same for Boo, for all of our babies. Last: I'm glad that you and your hubby got a chance to go to a show! I feel the same way about ither things I grew up with, such as living in the same city as all my extended family, riding my bike with my sister right before bedtime (in the almost-dark), little things that I am not sure he will get to have. Great post, made me very nostalgic! Bud, my 5-year-old loves LOVES the first Star Wars trilogy. There's hope for these kids. They may just know a good thing when they see it. Oh yes - I know how you feel. I get panic attacks thinking about the future of this world. You are such a great writer. Very well-put. I wonder things like that all the time, and also if our kids will grow up to scorn our stuff just because mom and dad like it, without really judging it by its own merit. I feel confident that there will be heros and happiness for our babies. We had a lot of junk and weirdos out there too, don't forget. I'm sure Sam will appreciate E.T and Star Wars and the like. Who wouldn't? Even if they are dated they are undeniably good. I want to go to Superman too! I saw the first one in a drive in theater as a kid. It left a permanent impression on me. 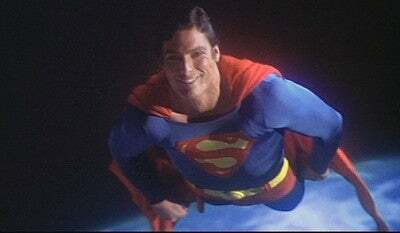 So much that I loved Christopher Reeves forever and was so sad when he passed away. Just copy the link and paste and it works! It scares me to think of the world that our kids will grow up in. I hope that their childhoods are as magical and wonderful as ours were. I guess I will just keep on praying. I've always had the feeling that maybe my sons will BE the heroes this world needs- yeah, big responsibility on my shoulders raising them, but it makes me more aware that I want THEM to be involved in the things going on around us so that they won't be clueless and can make smarter choices than we have. Maybe they can help change this place to make it better. We have to keep trying to do so ourselves, and they only learn from our examples. Let that fear inspire you and never lose Hope. you have done it again. said things that i hear myself saying. . .except you say them better. my hubby and i will be seeing superman on monday and it'll be the 2nd movie we've seen since bb was born. and for a LOOOOONG time i thought i'd never have kids because i was too freaked out by what could happen in this crazy world. it occurred for the first time after seeing the trailer for Inconvenient Truth that i no longer fear "the end of the world" like i did when i was younger. i now fear the slow decay of the earth. will our grandkids have to wear oxygen masks outside--will they even be able to go outside. and don't get me started on freedom. will my son know the awesomeness of playing til dark, walking to school, riding his bike alone on his street? i don't know. it's too scary to contemplate what might happen. but i DID have him despite my fears and i'm glad i did. the love has gotta count for something amid all the mess out there. Oh we're right there with you! We also saw Superman Returns over the 4th while visiting the in-laws... It was the 1st movie we'd been to see since Elijah was born. He's 10 months old! I read your post out loud to hubby it was so good and right on the mark.